I sit on the front steps and look down at my feet. The sun has set and I’m sitting here waiting for the dog. I’m in pajamas and it’s not even eight o’clock at night. I’ve yelled at my kids. Yes, the ones who have been home sick for a week. And it was something about picking up pencils? I don’t even remember. It’s been a week of kids in and out of my bed at two, three, four in the morning. How did I ever do this when they were infants? I sit on the front steps and look down at my feet. The stars are shining and I’m enjoying a cozy fall evening in my pajamas. I’ve spent the whole week with the kids. They’ve been sick, but we’ve had lots of time to snuggle, read books and watch movies together. They’ve even snuggled with me in the middle of the night. Someday they’ll grow up, so I’ll take all the snuggles I can get. Both tell the same story, and both are true. I always have been able to make both sides of the argument. Too often we see or read version two. We get the romanticized version of life from others and we feel inspired. For a moment. Romance is rose-colored glasses but at some point you have to take the glasses off. Then we are left wondering why our life doesn’t seem so rosy. Because you know what else is inspiring? Real. Knowing that other people are in the trenches with you. Knowing that the everyday can be beautiful and gratitude filled and hard and messy in the same sentence. Knowing that inspiration is not your circumstances or even how you face them, but who you face them with. Because I wasn’t on those steps alone. Can I do better? Sure. Can I be better? Definitely. Could I love more? Absolutely. Could I be loved more? Not a bit. The inspiration doesn’t come in what any person does, but it is God’s love in them that inspires. It’s not our job to set out to inspire people. It is our job to love and be loved, even when it’s not rose-colored. 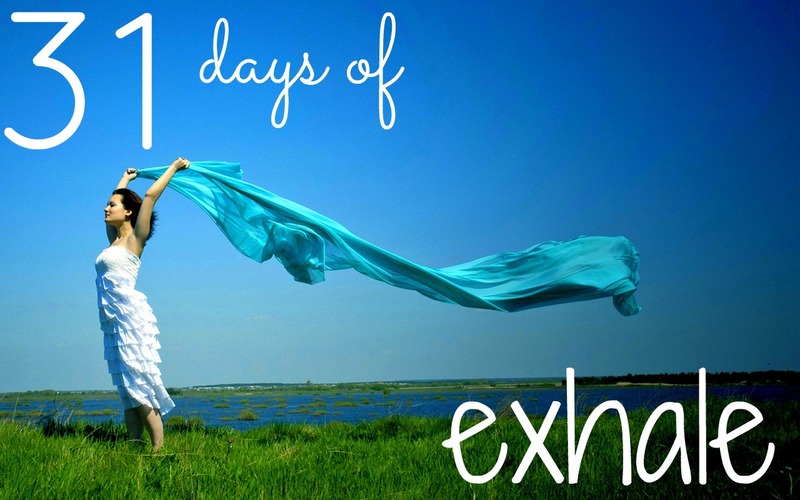 To see the rest of the 31 Days of Exhale, click on the link below.